“Haw-w-w-w-w!” You heard right! That sound can only mean one thing—that Bachelor of Artifice, Knight of Calamity and an alumnus of Doctor Merlin’s Camelot College for Conjurors is back. Yes it’s the marvel from Boonetown, Iowa himself—Lieutenant Phineas Pinkham—and he scores with bounders and grounders! The English team finds the diamond rather wet, and Phineas sacrifices to France the first time at bat. But hang around, fans, the game isn’t over yet! Von Bountz is the next one to fly over the plate—and he gets hammered into left field. Copyright © 2010 Age of Aces Books. 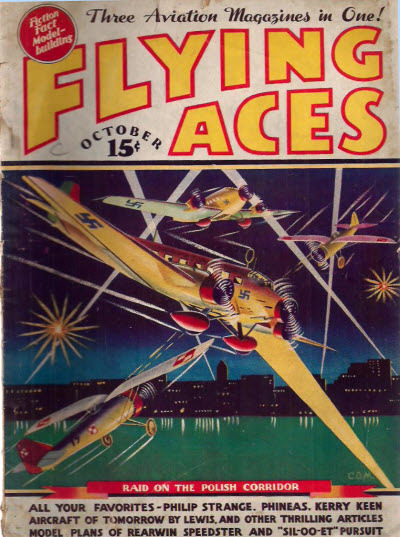 Pulp images copyright of their respective owners. All rights reserved.